Amadou Siribe playing with La Linea’s top team Real Balompédica Linense. 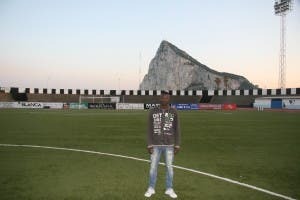 A YOUNG African immigrant rescued from certain death in the Straits is playing football with La Linea’s top team Real Balompédica Linense. Two-footed striker, Amadou Siribe, 19, left Mali capital Bamako two years ago to follow his dream of becoming a professional footballer, like his heroes Samuel Eto’o and Frederic Kanoute. But the dream became a nightmare when he and four others were stranded in a tiny blow-up dinghy while attempting the treacherous crossing from Tangier to Tarifa. At the mercy of the sea and with no water or food, Amadou and his companions thought they were going to die. “The water was very rough and dangerous,” he told the Olive Press. “One of us was bailing out because so much water was coming in. Dolphins were leaping out of the water and almost sinking the boat. “I fell in the water twice and had to be rescued. I swallowed so much salt water I became very sick. Fortunately, a Cruz Roja (Red Cross) boat crew spotted their tiny dinghy and rescued them, taking them to Tarifa. While there, being looked after by the authorities, he started to play football again. He was soon spotted by La Linea side Atletico Zabal, before heading to Valencia to find work, where he banged in 13 goals in nine games for local team Atletic Amistad. Now he has been snapped by by Real Balompedica Linense (Balona) after moving to La Linea crisis centre Hogar Betania. He also now has an agent. “I made my debut in a friendly against the champions of Finland in Marbella four weeks ago,” said Amadou.